Not so much a deal more of a find. 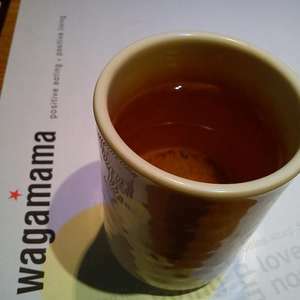 You can get Green Tea for free at Wagamama restaurants. Isn't the green tea free anyway? We've never been charged for it (but we do eat there a lot). It's free when you purchase food. Not a walk in freebie. A drink to wash down the awful food..sounds great! has always been free, but you have to buy something. Chapchap have you even been to Wagamamas? The food is lovely and a great atmosphere... you need to get out more. No harm in bringing this to people's attention for those who don't know you can ask for a free tea when they're eating there. Shame green tea is vile, lol. I love wagamamas and the green tea is nice as it isnt too strong. And yes not everyone knows about it so yes its very helpful to point it out to people so HEAT! Chapchap have you even been to Wagamamas? The food is lovely and a great … Chapchap have you even been to Wagamamas? The food is lovely and a great atmosphere... you need to get out more. Thanks for your advice-but having lived in the far east for a few years i can tell you the food a wagamama is crap!! The atmosphere you speak of is English people ( who would not know the difference between real east Asian food and supermarket's food).With chains i use my gourmet card- but with wagamama it is so dreadful i don't bother. Have you ever eaten in a real east asian restaurant ? I think no. But good luck with your choice you little girly boy as i would say wagama is created for ignorant idiots like you. Thanks for your advice-but having lived in the far east for a few years i … Thanks for your advice-but having lived in the far east for a few years i can tell you the food a wagamama is crap!! The atmosphere you speak of is English people ( who would not know the difference between real east Asian food and supermarket's food).With chains i use my gourmet card- but with wagamama it is so dreadful i don't bother. Have you ever eaten in a real east asian restaurant ? I think no. But good luck with your choice you little girly boy as i would say wagama is created for ignorant idiots like you. I have eaten in real Asian, Polish, Japanese etc restaurants AS WELL as places like this. I like them all; because you, know its perfectly OK to like things that are not 100% authentic as well as the ones that are. If you like it, you like it. At 2am on a Saturday night millions stuff dodgy kebabs and pizza's down their throats, why? Because they like it. Million eat McDonalds and BK every day; why? Because they like it. Everyone's tastes and ability to eat in restaurants depends on many factors, location, budget, availability and taste. Your post was way overboard and unnecessary. And really, calling someone a "little girly boy"... You write like a elitist food snob but you resort to calling someone that, just because you don't agree with them? Clearly your classiness stops at a certain level, right before intelligence and politeness begins. I have eaten in real Asian, Polish, Japanese etc restaurants AS WELL as … I have eaten in real Asian, Polish, Japanese etc restaurants AS WELL as places like this. I like them all; because you, know its perfectly OK to like things that are not 100% authentic as well as the ones that are. If you like it, you like it. At 2am on a Saturday night millions stuff dodgy kebabs and pizza's down their throats, why? Because they like it. Million eat McDonalds and BK every day; why? Because they like it. Everyone's tastes and ability to eat in restaurants depends on many factors, location, budget, availability and taste. Your post was way overboard and unnecessary. And really, calling someone a "little girly boy"... You write like a elitist food snob but you resort to calling someone that, just because you don't agree with them? Clearly your classiness stops at a certain level, right before intelligence and politeness begins.